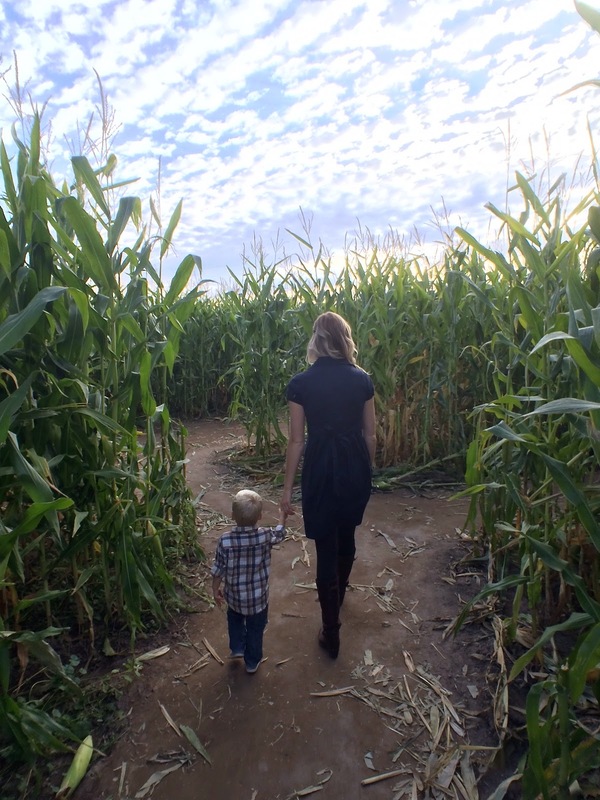 Then we let Liam lead us through the corn maze, where he giggled around each corner trying to find the right way to go! The stalks were high and the maze huge, so we spent a fair amount of time chasing him down. Sometimes he loves running ahead and being independent, but other days he simply wants to hold my hand. It seems to fit perfectly in mine! The sun was setting and we had yet to pick our pumpkins, so we scurried ourselves to the hayride... I was picturing the most perfect setting of a jubilant little Liam running through the massive patch with the sun slowly falling behind him. Except that definitely didn't happen. Because oh my goodness, there was the most massive line for the hayride that I ever did see! Almost tear worthy long. So we began the wait, one at time, while the other took Liam back to the courtyard to play. Kettle corn was purchased and devoured. Numerous bathroom breaks & diaper changes were had. Coats were retrieved from the car. Darkness fell. And then it fell some more. And when I say dark, I mean D A R K. We were at a farm in the absolute middle of nowhere Utah; no lights were to be seen. It took almost 1.5 hours to make it the front of the line, but there was no way I was driving home without a damn pumpkin. So at nearly 8pm, we climbed on the wagon and were finally on our way to the pumpkin patch. We couldn't see a thing, but Liam loved the bumpy ride. We chose our pumpkins by the light of our phones and hoped that our selections were going to look top notch in the daylight! So fun! I always love your photos, your family is just adorable! oh no, thats so horrible about the long wait - but i understand, i wouldn't have gone home without a pumpkin either! Glad y'all had fun, but oh my goodness about the wait, that's awful. Love your pictures. 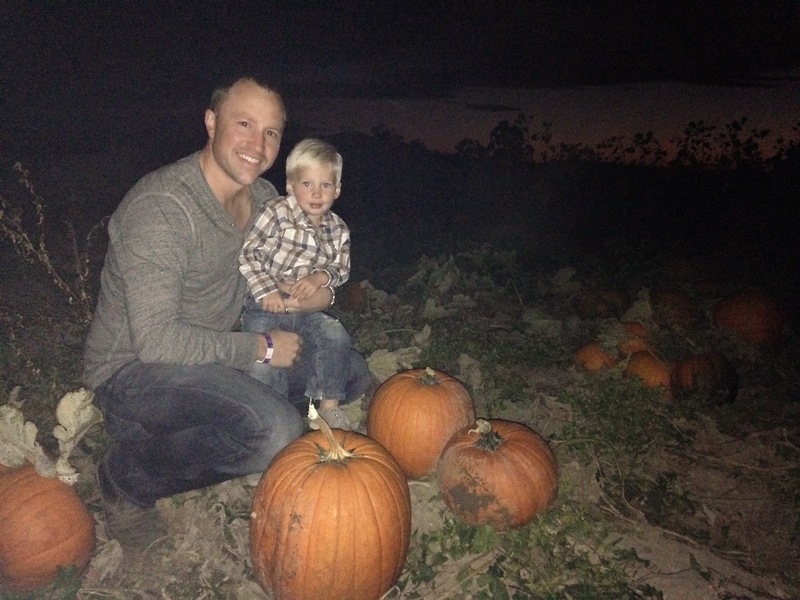 Haha, aww I love the nighttime pumpkin picking adventure! 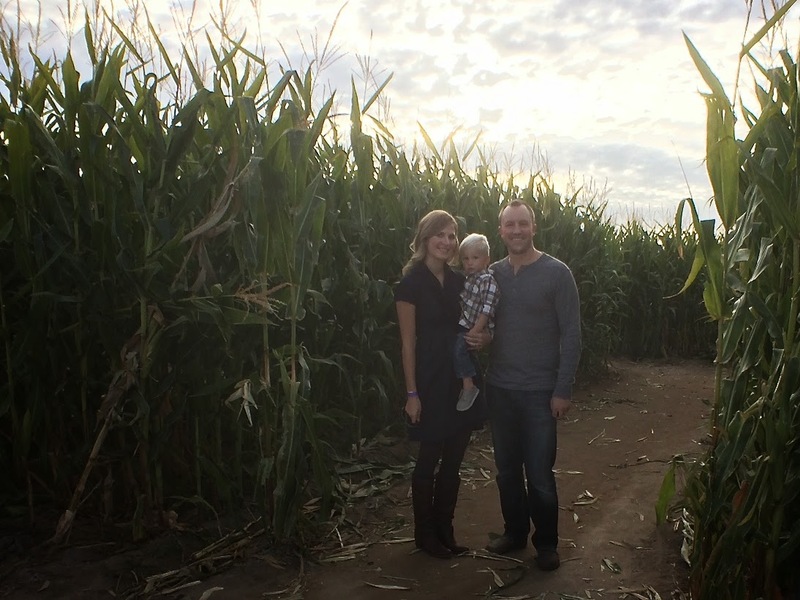 We also got to cut our pumpkins off the vine in a TRUE pumpkin patch experience! Oh boo. Sorry your experience wasn't what you had hoped for. It never is, is it? I always seem to have this amazing beautiful scenario in my head, thinking that the photos will be beautiful and everything will be perfect and it never fails that it all goes to hell. :) Hahaha. Well, maybe that's just me. It's a super cute photo though! And sounds like it was fun! There's always next year. Omg how crazy that you were picking pumpkins in th dark! 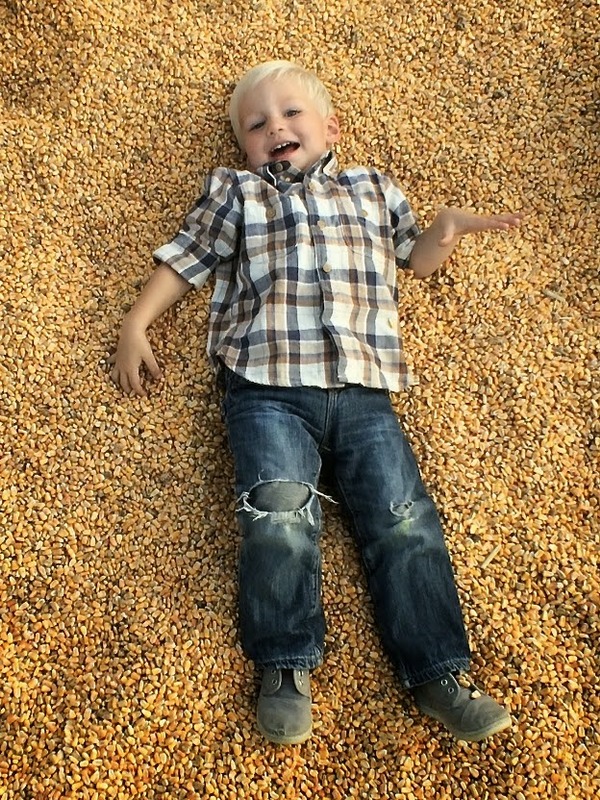 At least he had a blast with the corn and maze before it got dark! That corn box looks so fun! I saw someone else did that at their pumpkin patch and was so jealous. It even had a slide that you could slide into the corn box with. We went to a patch that had a corn box too! I never knew they existed until just a couple weeks ago! But my son loved it too. I couldn't get him to leave. Totally wanting one in our backyard now! Pretty awesome that you got your pumpkins by moonlight although I am sure the wait wasn't too fun.